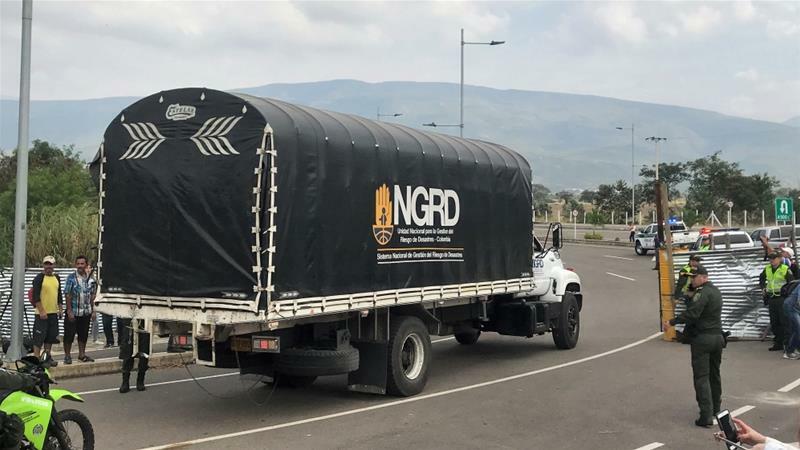 US aid arrives at Colombia border despite Maduro rejection Convoy carrying food and medicines reaches Colombia’s Cucuta a day after Venezuela barricades its side of the border. 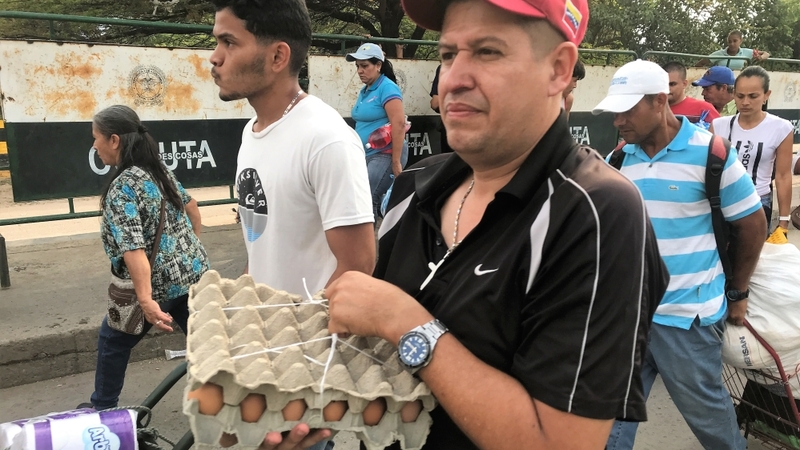 Cucuta, Colombia – Trucks carrying food and medical supplies from the United States have arrived in Cucuta, on the Colombia-Venezuela border, stoking tensions with the government of President Nicolas Maduro in Caracas. “We are not beggars,” Maduro told the military earlier this week, rejecting the move as a ploy to humiliate Venezuela. Amid uncertainty over the convoy’s fate, demonstrators at the Tienditas bridge entrance welcomed the trucks by blowing horns and calling for a change in crisis-hit Venezuela. Among a media scrum, some shouted, “Maduro out now”. 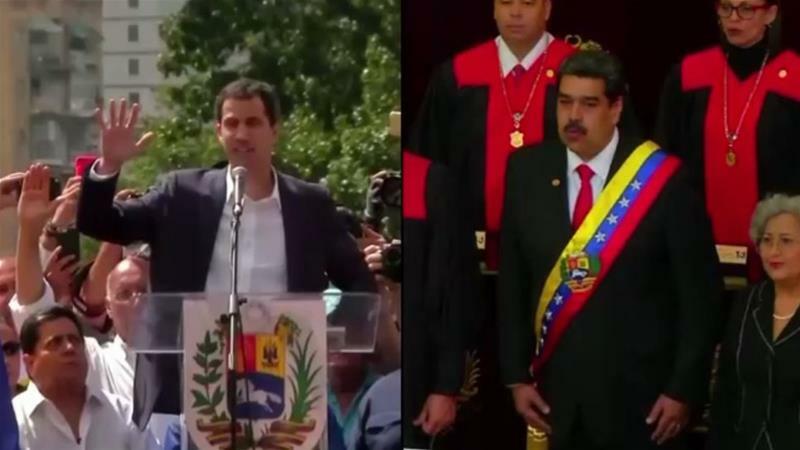 Members of the Venezuelan opposition have also converged in Cucuta to help plan and execute the delivery of the aid, in a calculated move seen as a test of the Venezuelan military’s loyalty to Maduro. Venezuela’s socialist economic system has been severely hit following the collapse of world oil prices in 2014. Inflation has skyrocketed, and since 2016, more than three million Venezuelans have fled to neighbouring countries amid a shortage of food and medicine in the country. 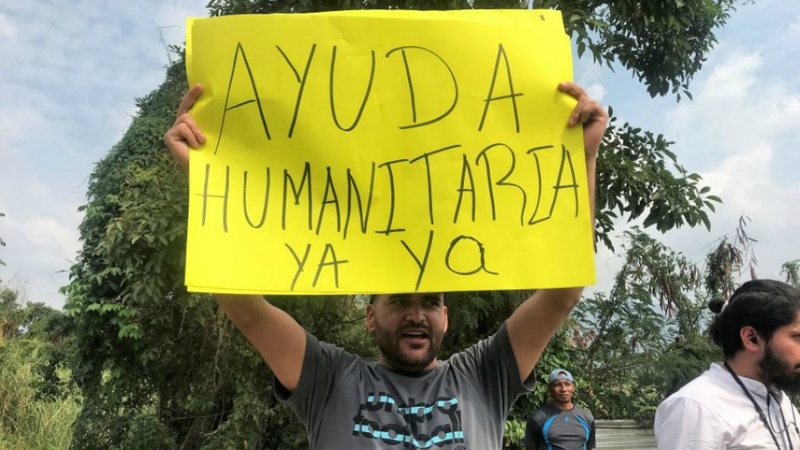 At Tienditas bridge, Luigi Rivas, a 31-year-old Venezuelan migrant, brandished a cardboard sign with the words: “humanitarian aid now”. “It is a cowardly action he’s made,” Rivas told Al Jazeera, referring to Maduro’s bridge closure. In a Twitter post on Wednesday, Mike Pompeo, the US secretary of state, said “Venezuelan people desperately need humanitarian aid” and that “the regime must let aid reach starving people”. For his part, Maduro has continuously denounced Washington’s interference in Venezuelan affairs. The United Nations has appealed for a cash injection of $738m this year to help Venezuela’s neighbours cope with the mass exodus. The Regional Refugee and Migrant Response Plan has allocated $315m to Colombia, $117m to Ecuador, $106m to Peru and $56m to Brazil – the countries hosting the most Venezuelan migrants.